New project - deadline 3 weeks - scribble in notebook - campaign comms plan to write by next week - scrawl post-it note, add to colour-coded post-it-note-papered desk backboard - missed a deadline - *!##!*! !# - make mental note to plan better - Fred asks if I’ve written stakeholder briefing - look for pink post-it note - (think it was pink) - find torn under desk - briefing should’ve gone to policy yesterday - help! - pen post-it note to self, ‘must plan better’ - spill coffee on it - check project grid - not updated for a week - project evaluation overdue - not even started - panic! If this is this what your project management and planning are like, you need help. Of course, relying on memory and post-it notes is an extreme case, likely to end in tears as you juggle so many balls you don’t even notice the ones you’ve dropped - until you drop them all! And it is quite possible to manage a project using traditional spreadsheets and grids, even manually updated display boards and logs. But there are more modern, convenient, interactive ways to keep track of multiplying tasks - even if you think you’re quite good at keeping tabs on things. So, for the last two months, I’ve been using it, too. First impressions. It’s really easy to get the hang of. What’s the best thing about it? It may seem obvious, but it connects you with people, not just immediate colleagues but anyone and everyone you’re working with on a project. Admittedly, it makes it more difficult to lurk in your hermetically sealed personal silo, content to get on with things on your own, because that’s the way you like it. You could say Trello shakes you out of this illusory comfort zone - illusory, because lack of co-ordination with colleagues and stakeholders means deadlines are missed, bottlenecks bulge, project targets are compromised, and the buck is likely to stop - most uncomfortably - with you! Using Trello, everyone involved in a project can see at a glance what stage it's at, who is responsible for what, which tasks have been completed, what’s next, etc. And you can update it anywhere, at any time. With this sort of agile interaction, projects are likely to run more smoothly. In my comms team, we can be working on numerous projects simultaneously, small and large, short and long - from one-off blog posts to fully fledged comms campaigns, often with extended clearance/approval lines, involving multiple stakeholders, and exploiting multiple channels. Trello helps us to keep track of all these elements - and each other. Each member of a project group has a column, which acts like a virtual card index. Each project or job appears as a card. 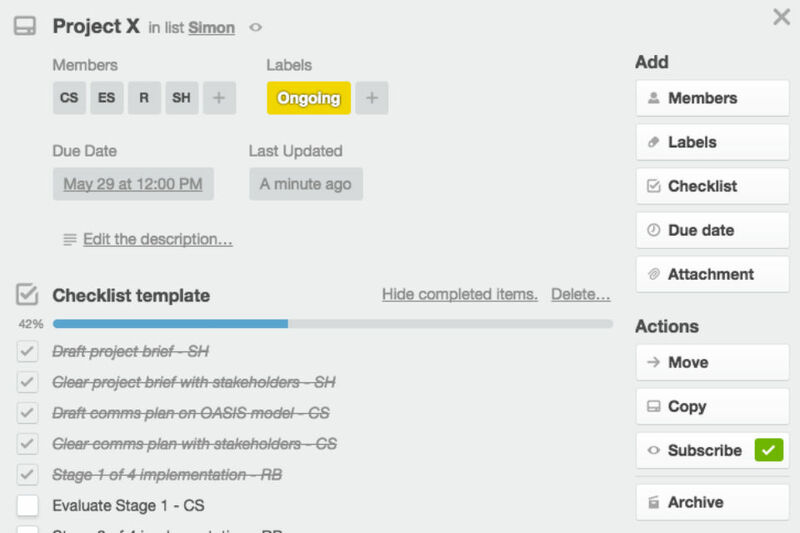 You open a card to show all the details of the job - due date, a checklist of required actions, space for comments on activity, a record of who’s done what, and the last time it was updated. The checklist can be as long or as short as you want, including just the main actions, or the intermediary ones as well. When you’ve completed a task, you can drag and drop the job card to the person responsible for the next task on the checklist - and this automatically triggers a message to them, so they have no excuse for not knowing! To provide a full picture and context for each job/project, you can attach important documents, source material for blogs, briefings, etc., to a card, allowing you to share them with colleagues or work on them together. Documents can be simply dragged and dropped from your desktop. You can also cut and paste in links to relevant external sites. If you want to, you can drag cards to a different board, another job list or a different position on your list. And if you regularly work on a specific type of project, to save effort you can create a job card template for it. It’s a lame - and dated - excuse to say “I’m no digital whizz”, as a cop-out from learning anything new that’s technology-based. You don’t need to be one. Think of the way you were working 10, 5 even 2 years ago. All the digital technology that may have seemed daunting at the time, quickly became routine; and the ongoing technology transformation in departments is making new solutions more accessible. I find Trello pretty straightforward, and much more user-friendly than the 'spreaded dreadsheet' (I think that’s right!). If unsure, I have the aforementioned techie on hand to answer FAQs (frequently asinine questions), not because he is digitally highly literate (though, grudgingly, I admit he is) but because he’s a practised Trello user and a treasure trove of tips. Other solutions are available - I believe you’re obliged to say - but if the future of the Civil Service is smarter, closer, quicker, more flexible working with colleagues, wherever they or you happen to be, then apps like Trello can certainly help. And you can do your bit for the rainforests, too - sorry, post-it-note manufacturers! Must confess I thought I wouldn't be able to get it but if you use Chrome rather than IE it works! Also worth checking out Asana, which does a similar job but has - in my view at least! - a better user interface. I've been using theTrello iPad app for about 3 months outside work, collaborating on a novel with a friend in the US. We use one card per chapter and set out scenes, characters and what we still need to decide. At one point we came to the conclusion that the timeline needed to be rearranged, and it was easy - just push the cards round with our fingers. We can chat on Skype and develop our story notes as we go, thousands of miles apart. At work, I'm in the training section and am already using my app to plan my next project. Trello's simplicity and versatility are a great help. Fantastic article and I 100% agree with your comment: "It’s a lame – and dated – excuse to say “I’m no digital whizz”, as a cop-out from learning anything new that’s technology-based...." I have asked my manager if I can print this quote in A0 size around my office! (don't worry, I won't). Great blog post, I'm an avid Trello user and I would put myself firmly in the non-techie category. It's much easier than spreadsheets in my view and a great tool for collaborating with colleagues who aren't based in the same office as you. Our default browser at work is no longer supported by Trello but they are rolling out Google Chrome which is compatible. If I suggest using this (or any cloud service) the first thing I will be asked is "Is it secure? Can we trust Government information in it?" How have other Departments overcome that? This sounds very interesting and I clicked onto the link to find out more only for my access to be blocked by my department! This is not the first time recommendations via a civil service blog have been blocked - this is frustrating, either we are being given the green light to move into this century or not! Hi Trello uses a project planning methdology called Kanban. There are many software packages out there that apply this sort of planning technique. A white board and post-its are ideal tools for Kanban, but if software is required One Note can also do the job if needed. If there are any others interested in exploring how Kanban approaches can be applied to Project Delivery, I'd be keen to make contact.. I can be reached @decc.gsi.gov.uk. Hi Adrian - really interested to read your comments & offer of contact on the CS blog concerning Trello. I'm unable to access the app at work and as a follower of LEAN principles my ears pricked up at the mention of Kanban, in addition I am a self-taught project manager and still have much to learn. be great to hear from you but couldnt get your email address to work?? I've been using Trello with my team for near well over a year now, and find it utterly brilliant at keeping track of all our different products we are building. Sounds interesting, read the top tips, tried to get to the app and like Kevin, it is blocked! Any one managed to get the 'business' version approved for purchase in their department? We're using the free app but concerned over stability as we grow it's use. I don't know anyone using Trello Business Class in my department, but it's probably only going to be as stable as the free version anyway - they run on the same infrastructure and are provided by the same company. If you're worried about the free version being discontinued, you could try making regular HTML backups of any boards with information you don't want to lose on. We use the open source tool here: http://tianshuo.github.io/trello/. We are using Trello in High Speed 2 for both Kanban boards and hot desk allocation. Latter has had some extra work done by our developer (interface and API work) and designer (graphics) to look less like a list - we started with it - and more like a modern web app. There are some risks associated with account management - I suggest engaging with your ITSO first to ensure you are not breaking any policies (even unknowingly). Having organisation account helps a bit though. If interested more in this find me via LinkedIn. Thanks to everyone for their comments on my blog. It's great to hear that those of you who are able to access Trello also find it a useful aid to your work. For those who can't, I understand your frustration. I'm aware that some departments currently block apps like Trello, but this isn't really something I can comment on. However, things are changing, and gradually more of us are gaining access to cloud-based solutions. Six months ago, for example, Trello would not have been an option for me at Cabinet Office. Your browser is no longer supported and can not run the latest version of Trello. We're using Trello for our agile project to replace our intranet in DfT. Finding it very useful to manage our sprints. I use Trello for my personal task managemnt and find it really useful. Second all the positive comments, I used it when working on building an intranet site for HMRC and it was great for keeping track of tasks and communicating with developers. We assigned each page to a card and it worked really well. What a great app! Be great to know who's working this way from projects through to Programme/Portfolio Management Offices? Who's on track to meet end-to-end project delivery needs using this way of working? "Your access to this website has been blocked by the DWP's internet filtering software. Access to this URL is denied. The requested URL: http://www.trello.com is a DWP blacklisted site. This action has been recorded"
Amazing insight into the everyday roadblocks to productive work in the Civil Service... I'm on the outside (large multinational corporate) and it's a red-tape behemoth but at least I can get to use Trello, Podio, Asana, Wrike and the one I like most Freedcamp (with the d in the middle). There is also a virtual board called Kanbanchi - but like the others, unable to use on HMRC. So frustrating especially when flagged on CS blog.